McIntosh C220 Vacuum Tube Preamplifier possesses all the flexibility modern systems require while maintaining the highest-quality two-channel performance. All signal switching is done electromagnetically with switch contacts sealed inside glass cylinders filled with an inert gas. Locating these switches adjacent to the input/output jacks virtually eliminates crosstalk, and their sealed construction guarantees trouble-free operation. 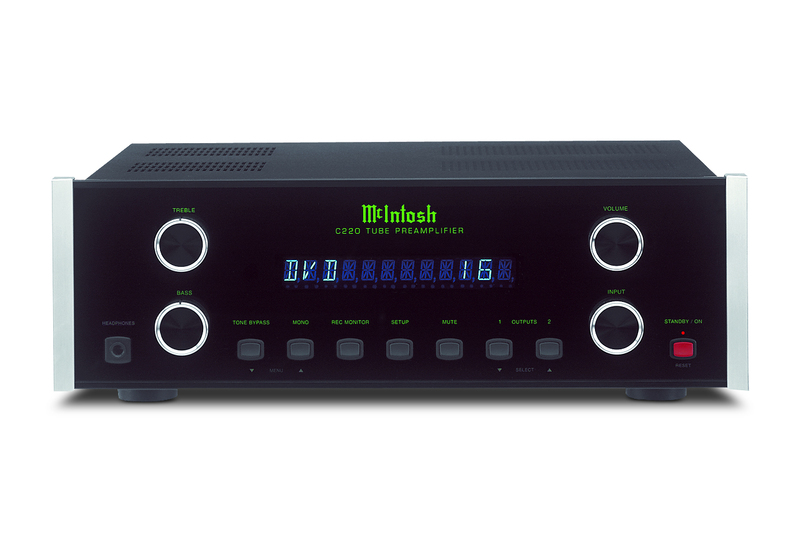 McIntosh C220 allows for electronic, independent level adjustment for each of the eight source inputs via the front panel or remote control. Channel balance is electronically adjusted and stored in memory. A moving magnet phono stage incorporates time-proven 12AX7 Vacuum Tubes, for simplicity and superior performance. Low-distortion bass and treble controls, invaluable for older recordings, provide a wide range of tonal adjustment and may be bypassed when not needed.